Choosing the right window treatments can be challenging. What treatment offers the function that you need? Which style best suits your room and your decor? Browse our portfolio of today’s stylish treatments and let us – the decorating editors from Better Homes and Gardens® magazines – guide you through the decorative and functional features of each to help you choose the perfect fit for your windows. Eyes without eyebrows would seem somewhat expressionless, and windows lacking the dash of color, texture, or pattern that fabric offers may befall the same fate. Top treatments offer that just-enough addition. Architecturally beautiful windows seem softer when you grace the top with fabric. Or if the window itself isn’t lovely, the view may be. To preserve it, a treatment across the top of the frame gives the scenery the spotlight while subtly linking the window to the style of the room. 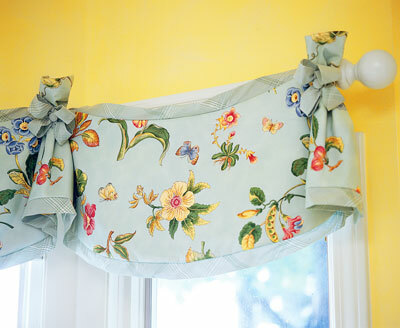 For a casual effect, hang a simple rectangle of fabric – a valance – using sewn- or clipped-on rings or fabric tabs threaded onto a decorative rod. Select a lightweight fabric in a stripe or small print. Or, consider solid-color fabric and add a few playful embellishments such as buttons or beaded fringe. Any unpretentious top treatment appears right at home in a kitchen, a child’s bedroom, or a laundry room. To gain privacy and light control, layer a top treatment with a roller shade or honeycomb shade that disappears behind the fabric when raised. Top treatments can put on a more formal face, too. A shapely, fabric-wrapped cornice board or a fabric valance with crisply tailored box pleats can inject architectural character and traditional style into a room. 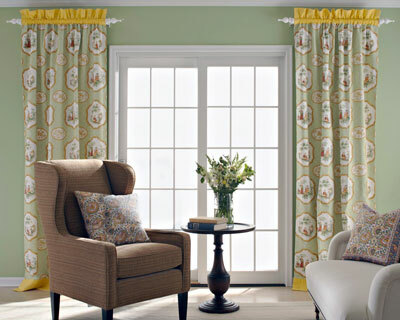 Dining rooms, living rooms, and gussied-up bedrooms earn a distinctive statement with one of these treatments fashioned from a weightier fabric in a classic print or narrow stripe. Trade the traditional fabric for a bold, large-scale print or wide stripe, and a treatment can appear right at home in a contemporary or casual setting. 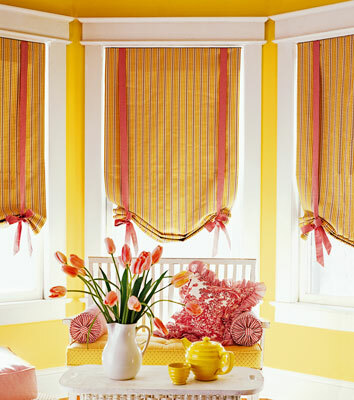 Box pleats draw attention to this valance with tone-on-tone striped fabric and button embellishments. The dressmaker detail can feature crisp creases for a tailored look or can be more loosely structured for softer, casual appeal. Intermittent gathers-punctuated with bows-are linked by swaths banded in contrasting fabric that rise and fall, giving this simple valance graceful form. Tack this type of top treatment directly to the window frame at the gathers. 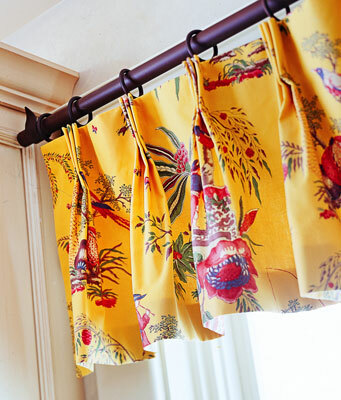 Hanging from rings on a decorative rod, this triple-pleated valance in a lively floral makes a casual companion for French country style. For contemporary appeal, skip the pleats and attach the valance with clip-on rings. Plywood cut to a desired shape and wrapped in batting and fabric or decorated with paint or wallpaper constructs this treatment. The cornice mounts to the wall several inches beyond the side trim. Unmatched in versatility, fabric panels can be as glamorous as an evening gown or as simple as a sundress. Although the terms "drapery" and "curtain" panels are often used interchangeably, curtains are typically lightweight, unlined, and suspended from a simple rod by tabs, ties, or rings, or threaded via a pocket onto a rod. Most draw back by hand to create a simple window treatment that works well in more casual settings, such as bedrooms, kitchens, and family rooms. Café curtains are panels that cover the lower half of a window and are threaded onto a rod or suspended by ties, tabs, or rings. 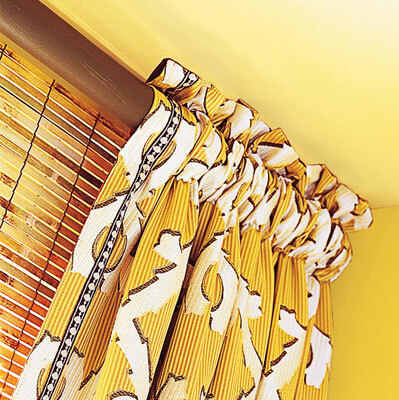 Typically paired with a valance or shutters on top, caf�s lend charm to a kitchen, bathroom, or sunroom. Draperies are usually more formal in appearance than curtains. Typically floor-length, fashioned from heavier fabric, and lined for more weight, draperies are often attached by hooks to a traverse rod. A cord mechanism draws the drapes open and closed. Draperies don't always draw back as compactly, so if there is minimal wall space around a window, or if the window itself is narrow, you may want to consider curtains or another treatment type. Both draperies and curtains can control the amount of natural light in a room, reduce winter heat loss and summer heat gain, and enhance or conceal a view. For visual variety and to suit your room's style, consider dressing up plain panels with cording, fringe, or other embellishments. Layering with top treatments and shades brings dimension to any window. 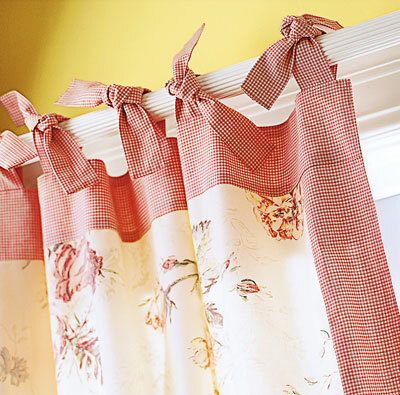 Ribbon ties romance this charming curtain panel, securing it by simple bows to a decorative rod. Choose ties that match a border fabric or contrasting ribbon that lends stylish flavor to cottage or country settings. 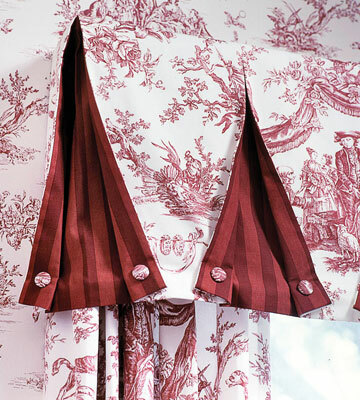 A sleeve stitched in the top, or header, of this panel allows the curtain to slip over a rod and be opened and closed by manually sliding the fabric back and forth. Extra fabric gathered above the rod pocket adds a ruffled detail. Goblet pleats – a wineglass shape formed above the pleat’s pinch – introduce an air of elegance to this drapery. Pleats naturally draw the eye upward at the window, giving the illusion that a room is tall and grand. 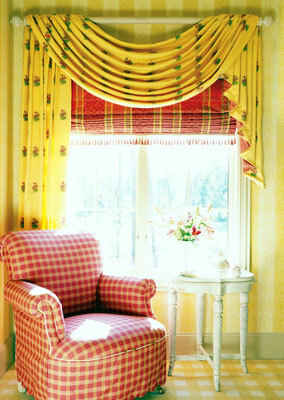 A panel draped loosely over a decorative rod forms this swag and jabots that soften the window’s edges. Jabots can hang evenly in length, or try a relaxed, asymmetrical look. A simple pair of sheer panels moves with little effort and filters light, preserving a favored feature of the sliding door. Lest you think sheers come only in a plain-white option, check out today’s choices, including pretty pale colors and punchy patterns. Because the last thing you want to do is weigh down your airy look with a heavy wood or metal rod, try a hanging system, such as this subtle cable that supports the panels with simple ring clips. Mount panels off the door’s frame and your window treatments become art. Purely decorative treatments are perfect for sliders that receive constant use or doors that frame unbeatable vistas because the view remains barrier-free. The panels don’t move, so go ahead and mount the rods out of reach (these are positioned 12 inches above the top of the door’s frame) for a design trick that visually adds height to a low ceiling. Select a boldly patterned fabric, so the panels double as art. A 4-inch contrasting cuff and ruffled top edge, dress the panels for formal spaces. Cheerful fabrics draw attention to treatments and away from blasé doors. A simple valance gives a plain sliding door a finished look without blocking views or hampering operation. As the focal point of the casual dining area, this treatment packs a visual punch with a zigzag hem banded by solid blue. To help the valance hold its shape, the fabric is stapled to a U-shape wood frame attached to the wall with L brackets mounted 18 inches above the door frame. Sliders often get lots of traffic, so dress them with treatments made from hard-wearing or easy-cleaning fabrics. These panels-hung on a 1-inch diameter rod through 2-inch grommets-are fashioned from durable outdoor fabric. 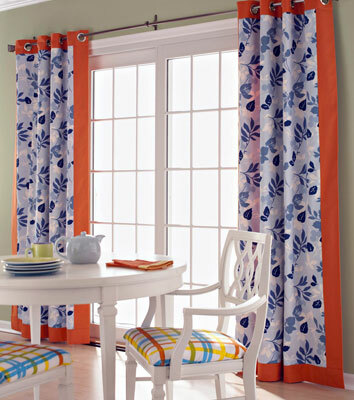 A generous 4-inch orange band, framing the playful leaf pattern adds visual presence to the curtains and draws attention away from the ordinary doors. Don’t hinder the usefulness of your sliding door when dressing it. Try these tips. Easy access. 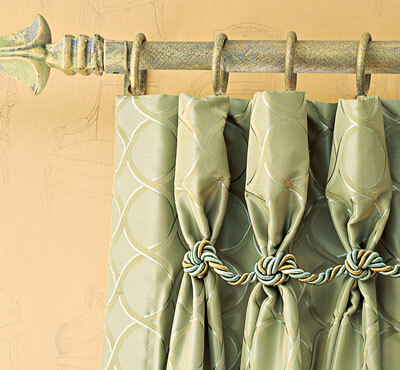 Use tiebacks to cinch stationary curtain panels aside, especially at the door-handle side, to support door function. Watch your head. Mount top treatments high enough above the door frame so the hem doesn’t brush heads passing through. Don’t puddle. Hang curtain panels that will be opened and closed a smidge above the floor to keep them clean. "Grace under pressure" might best describe window shades, which can be as stylish as they are hardworking. 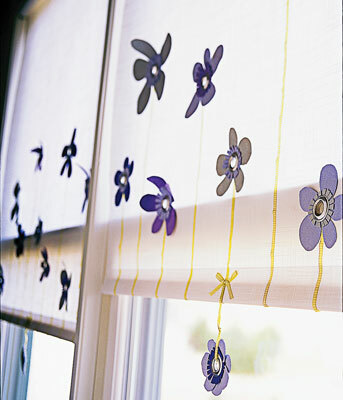 Shades, such as Roman, roller, tie-up, and balloon, raise and lower as needed and, depending on the fabric, can filter or block sunlight when lowered. Roman shades depend on a system of cording, threaded through rings on the back of the shade, to raise and lower the fabric panel. 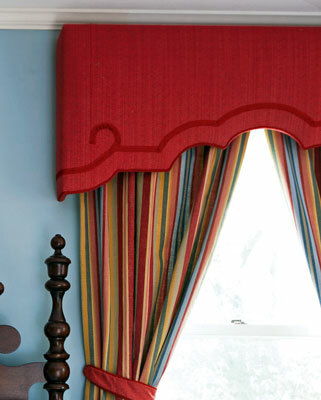 When lowered, a Roman shade hangs flat, revealing stylish fabric patterns and embellishments. The Roman shade stands pleasingly on its own, or paired with panels for a layered effect, in virtually any room to complement a range of styles. For a charming, relaxed look, consider a tie-up shade. 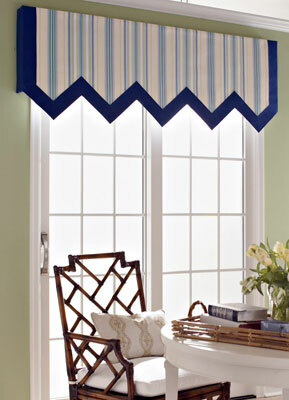 Rather than pull a cord to raise this fabric panel, roll the fabric upward and tie the ribbons or cords to hold the shade at the desired height. 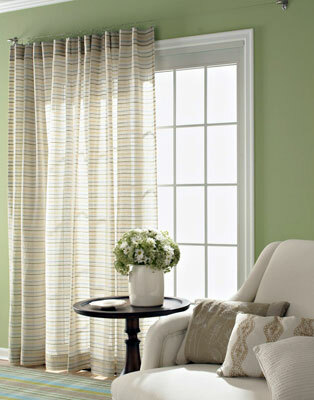 This pretty window covering is comfortable in a casual setting. The tie-up shade shows off favorite fabrics. When the flat panel is rolled up, enjoy a hint of its back side lined with a complementary print or solid fabric. 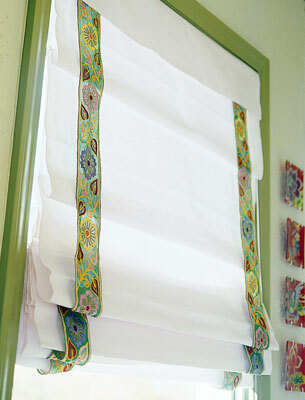 Give a slight tug on the bottom of a roller shade to raise and lower it in varying degrees. 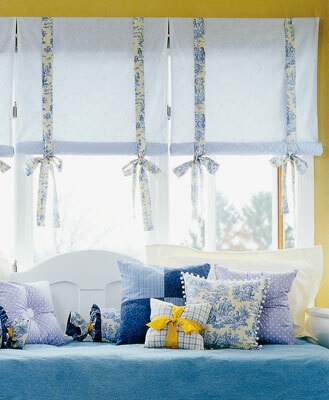 The simplest of looks when used alone, roller shades are more often paired with a valance or curtain panels. Their style and function suit every room in the house.